Mathematical difficulties are a widespread problem for many children all over the world. The chapter discusses factors that predict arithmetical difficulties and interventions that are used to foster children’s mathematical skills in primary school. As factors that contribute to mathematical difficulties, national and cultural aspects, socio-economic differences, attitudes and emotions are examined. 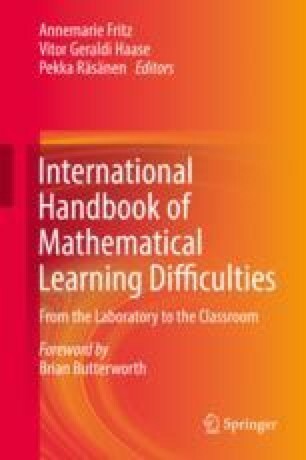 In this regard, the chapter highlights the influences of teaching methods, poverty and mathematical anxiety for math abilities and partially mathematical learning problems. Interventions in numeracy are classified in varying degrees of intensiveness (‘three waves’). The chapter analyzes advantages and disadvantages of all three ‘waves’ (whole-class approach, light-touch individualized and small-group interventions, highly intensive approach) so that factors which facilitate an intervention can be identified. OECD. (2013). PISA 2012 assessment and analytical framework: Mathematics, reading, science, problem solving and financial literacy. OECD Publishing. https://doi.org/10.1787/9789264190511-en.